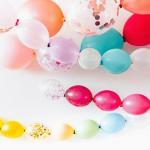 Your balloon bouquet is taking shape nicely. 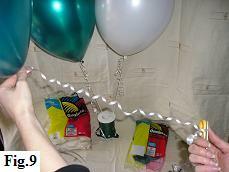 We've filled the first of three balloons with helium and attached it to your pre-prepared base, using a curling ribbon. 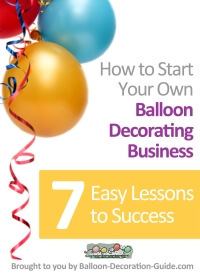 Just two more steps, and your balloon centerpiece will be finished. Repeat steps 1 and 2 for the last two balloons. 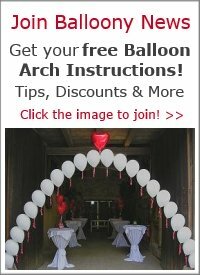 To achieve the correct positioning for your second balloon, pass the ribbon through the hoop on your base and adjust the height until the balloon slightly touches the one above it. When you're happy with the positioning, tie off the ribbon with two securing knots. 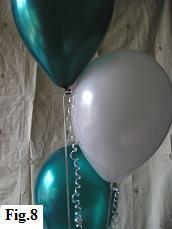 Follow the same procedure for the third and final balloon (fig. 8). 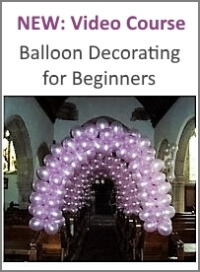 To add the finishing touch, curl the loose ends of the ribbons at the balloons and at the base. To do this you take an open pair of scissors. Starting at the knotted end, place the ribbon between your thumb and the blade edge and then pull the scissors down the entire length of the ribbon. Try not to grip too tightly as you will make the curls too tight (fig. 9). Congratulations! Your "Simple & Elegant" centerpiece is done!